I should start this review by admitting that I am an Alan Moore fan and a very big one at that. So much so that I consider Watchmen, V for Vendetta, and From Hell required reading for anyone who cares about words on paper. The man has reached a certain status in my mind where, even though I don’t consider him infallible (Promethea didn’t exactly float my boat), I will go the extra mile and really give his books a chance because I know the work pays off. Most of the time, I’ll blame myself if I don’t get it, like his recent League of Extraordinary Gentlemen Vol. 3 which was full of British pop culture reference and so a little out of my league. But now fans such as me have to reckon with Jerusalem. Alan Moore’s 1300 page book about no-one-knows-quite-sure-what-exactly. Alan Moore has more often than not steered me in the right direction, so as always, I was going to put in the work. 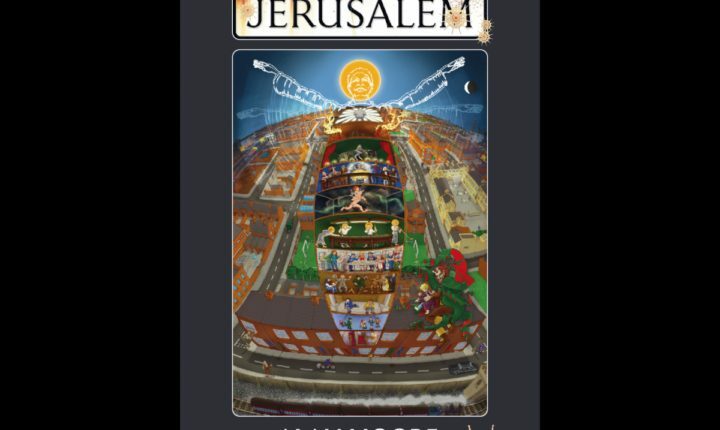 Like I said, it’s hard to describe what Jerusalem is about exactly, and maybe it isn’t about one very specific thing, but there are certain themes contained in this book. Divided into three parts, Jerusalem is about Northampton England, about time travel, about the afterlife, about the past, and in a sense about community. And it’s quite true that if you bear with it and all the stream of consciousness of the stories and the overly descriptive plot development, there are many times where the dots start connecting. The problem of course is that we are dealing with a very many amount of very detailed dots that don’t always connect. It’s confusing like that. Other times, you’re not sure what aspect of these dots you’re supposed to be paying attention to or if you’re supposed to pay attention to all of it, but when you see the connection, it’s quite cool. As if Alan Moore unpacking this world wasn’t at times frustrating enough, the man is also playing with the artform, with chapters that are written in the style of a play, poems, and even the dense style of James Joyce’s Finnigan’s Wake. Although I challenged myself to read these styles, I have to admit the website Annotated Jerusalem (https://alanmoorejerusalem.wordpress.com) was an incredible amount of help. As you’re trudging along Jerusalem and things are beginning to make a little sense (the second book Mansoul being the easiest of the three books), you start building up confidence and waiting for Moore to wrap it all up, and unfortunately he doesn’t. Or maybe he did, and I just didn’t get it. Again the references are endless and specific at times so feeling like you’re being left in the cold is probably going to happen. It seems like Jerusalem is a book that needs to be reread and analyzed and read along websites like the Annotated Jerusalem to truly be appreciated, but who is going to put in that much time? And, the idea that this book easily could have been twice the sizer is a scary thought. But, if you can get through it and get it, you deserve a medal. If you can get through it at all, you still deserve a pat on the back. Guess which column I belong to?